Today is the last day to comment on Bonneville Power Administration's proposed electric power deal that could provide service to the dormant Columbia Falls Aluminum Co. for up to 4 1/2 years. Before it can come to an agreement with CFAC, the power company has to go through a public comment period and address potential environmental impacts of the plant's reopening, former CFAC manager of external affairs Haley Beaudry said at the monthly Kalispell Chamber of Commerce luncheon on Tuesday. Beaudry, who lost his job along with the rest of the work force when the plant closed, has been doing "pro bono" work to help reopen the plant. The comment period is part of the public process required by the National Environmental Policy Act. "On one extreme they'll find there is no impact" since the plant has a history of operating in Columbia Falls, Beaudry said. "The other extreme may require a full-blown environmental impact statement. That could take a year and a half and we don't want that." 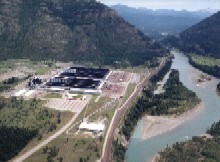 The aluminum plant, which went on line on Aug. 12, 1955, northeast of Columbia Falls, has been closed since October 2009 as a result of expensive power and increased international competition. In its heyday the facility employed more than 1,200 people. When the plant closed, the work force was down to 88. Bonneville has proposed providing 140 megawatts, enough power to restart two of the smelter's five potlines. A potline is a row of electrolytic cells used in the production of aluminum. Running two potlines would require a work force of 231 employees, but the goal would be to restart a third potline "to take advantage of the economy of scale," Beaudry said. Operating three potlines would bump the work force to 300 employees. "We'd have to go on the open market to acquire power for the third potline," he said. "It's a typical business challenge." The power deal would begin on April 1, 2012, if it gets final approval. The agreement also would commit CFAC to purchasing the power at the agreed Industrial Firm Power Rate for a minimum of nine months. "We'd like to see it back in business," Beaudry told the audience, encouraging chamber members to send in supportive comments. "The plant should run; it deserves to run." Beaudry said he hopes to resume working at CFAC if a power deal can be reached. During the two-year closure he has not been paid for his efforts to help restart the plant. He also has been involved in starting up an independent oil and gas company called MonTerra Energy that plans to focus on oil and gas production in central and eastern Montana. Comments on Bonneville's proposal may be submitted online at www.bpa.gov/comment or can be faxed to (503) 230-4019.